Currently collaboration with other users can happen in two ways, as Users and as Guests. Users are managed on a per-organization basis and can be assigned different roles. Guests on the other hand have a predefined permission level and are assigned on a per-site basis. Any site can have up to 3 Guests. 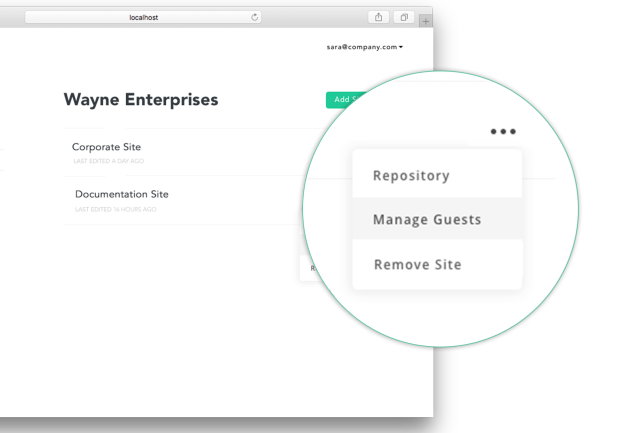 To add Guests to your sites, navigate to the dashboard and select “My sites” or an organization, choose a site and click on the “…” and then click on “Manage Guests”. The following screen shows you all the users that are already Guests to this site. To add a Guest, click Add Guest. This will add a new row to the list. Enter the new Guest’s email address you can repeat this process and continue adding Guests. When you’ve finished adding all new Guests, click Save to confirm the changes. This will send an email invitation to the new Guests to join the site. To remove a Guest, click the trash icon to the right of their e-mail. When you’ve finished, click Save to confirm the changes. Unlike Guests, Users can only be managed in Organization Accounts. Organizations are collections of sites assigned to a team. Organizations can have multiple users with different user roles work across all sites of an organization. You can create an organization on your dashboard by clicking on “Create an Organization” in the left sidebar. Once you filled in your information and named the organization you can proceed by clicking on “Create”. The Organization you created will now show up underneath “My sites” in the left sidebar. You can access the Organization’s sites and settings by clicking on the Organization. Depending on your role in this organization your dashboard may vary, please read more in different user roles to see what your assigned role allows you to do. To manage the team for an organization, navigate to the dashboard and select your organization, click on the in the upper right corner, and then click “Users”. To add a new User, click Add User. This will add a new row to the list. Enter the new User’s email address and desired user role. When you’ve finished adding all new Users, click Add to confirm the changes. This will send an email invitation to the new Users to join the Organization. You can cancel any changes to your Organization’s team by clicking Cancel in the bottom right corner. In Organizations, Users can be given one of three roles. These affect what the user can do in the CMS. 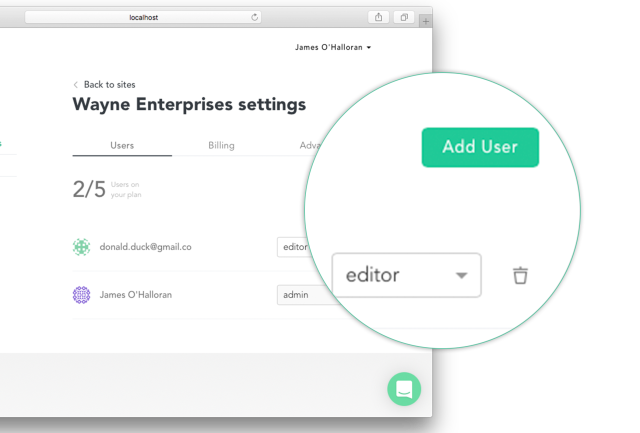 The editor role gives a User the ability to manage content across sites within that organization. Guests have the ability to manage content for their respective site but don’t have access to sites across the organization.